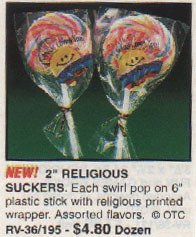 In 2001 I began getting huge catalogs from the Oriental Trading Company. I have no idea how they got my name and address, but I sure am thankful. 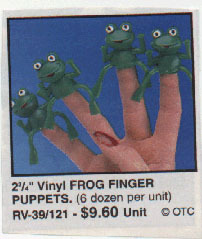 Without those catalogs, I’d have no idea how much cheap plastic junk is out there. In all fairness, there must be some needs getting fulfilled by these products because the company has been in business for quite some time. SOMEBODY has to manufacture the disappointing school carnival prizes that break after a couple hours, right? Otherwise, how could organizations capitalize off of youngsters’ misplaced hopes? 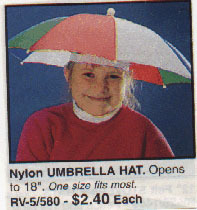 Keep dry and cool with this stylish umbrella hat. 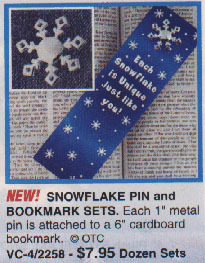 Great gift idea for people with no arms! 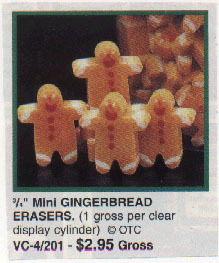 If you find the soulless stares and gaping, blood-colored mouths of these tiny gingerbread men unsettling, simply rub their little heads on paper until they’re nothing more than discolored stumps. But be prepared to sleep with one eye open thereafter… 144 gingerbread men is close to an army. What’s more clever than the timeless whoopie cushion? 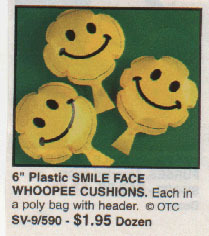 A whoopie cushion with a smiley face on it! A cheerful take on this highbrow classic. Why do these frogs look so happy? TWELVE of your one-of-a-kind friends. 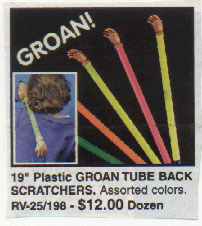 Tired of celebrating Independence Day with all that cumbersome dignity? 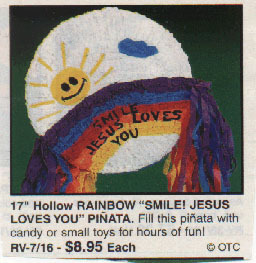 Fill with candy or small toys, then beat the snot out of it with a broom handle in a sanctioned frenzy of violence and greed- and remember to smile, ’cause Jesus loves you. GROAN! Need I say more? 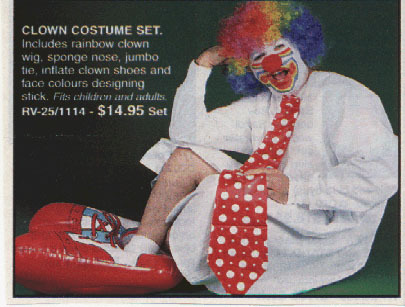 Anyone else disturbed by the fact that this clown appears to be wearing no pants? Is he squatting on a zany little clown toilet? When the domesticated animals take over the world, you can bet these three will be leading the charge. And any human who bought these atrocities will suffer consequences much worse than urine-soaked slippers. The cat in particular has a murderous glint in his eyes. 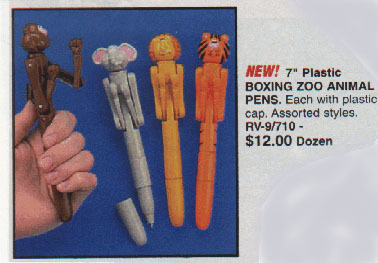 Ok, I have to admit these look like fun. But who thinks this stuff up, honestly? 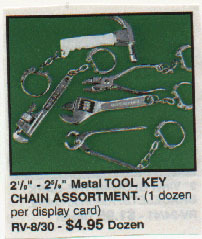 What exactly does a tiny pipe wrench keychain say about a person? And why would you need dozens of them? 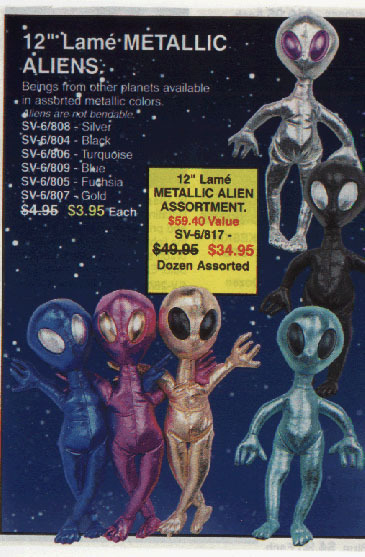 Boy, all those SETI people sure would freak out if they knew that beings from other planets were available right here, and in assorted metallic colors, no less! 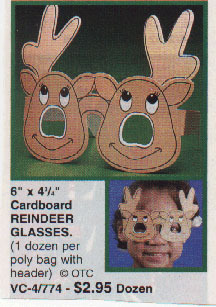 Obscure your child’s vision and frighten her playmates with these festive one-antlered, three-eyed reindeer glasses. 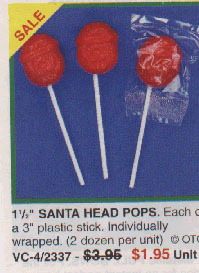 This holiday season, lick St. Nick’s face until you can no longer fight the urge to grind his cranium to a messy red pulp between your molars. 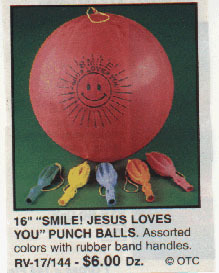 If the Jesus pinata didn’t ease enough of your aggression, you can slam your fist repeatedly into the smiley face and familiar phrase “Smile, Jesus loves you!” with these punch balls. Are they talking about the product or their target consumers?